Book group for grades 3-5. In collaboration with The Big Picture House, Nightbird is screening the film Holes, adapted from the Louis Sachar novel of the same name. "But if you forget to come back for Madame Zeroni, you and your family will be cursed for always and eternity." Those were the exact words spoken to young Elya Yelnats the day he forgot to repay the gypsy Madame Zeroni. From then on his family was cursed with bad luck. One hundred years later Stanley Yelnats IV is accused of stealing a pair of cleats from a major league baseball player and sent to Camp Green Lake (a dry lake bed in the middle of the desert). It never rains at Camp Green Lake, it hasn't for one hundred years. The secretive and mysterious Warden has each inmate spend every day digging one Hole to "build character." But when an artifact from the famous "Kissin' Kate" Barlow is found in a Hole, the Warden forces the boys to work double time leading Stanley to deduce they're digging because the Warden is looking for something. But what? And how is the mystery of Camp Green Lake connected to Stanley's family curse? Louis Sachar discusses Holes. ; Louis Sachar discusses Small Steps. ; Louis Sachar discusses There's a Boy in the Girls' Bathroom. 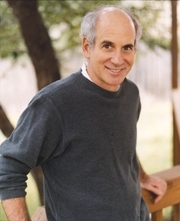 ; Louis Sachar discusses Marvin Redpost. ; Louis Sachar discusses Wayside School. Louis Sachar reads from The Cardturner. Louis Sachar is currently considered a "single author." If one or more works are by a distinct, homonymous authors, go ahead and split the author. Louis Sachar is composed of 12 names. You can examine and separate out names.